"Jetpack Jr." returns October 1st! “Jetpack Jr.” is back! October 1st new material begins appearing again at GoComics.com. Lots of surprises in store–I won’t let on now, you’ll just have to wait! 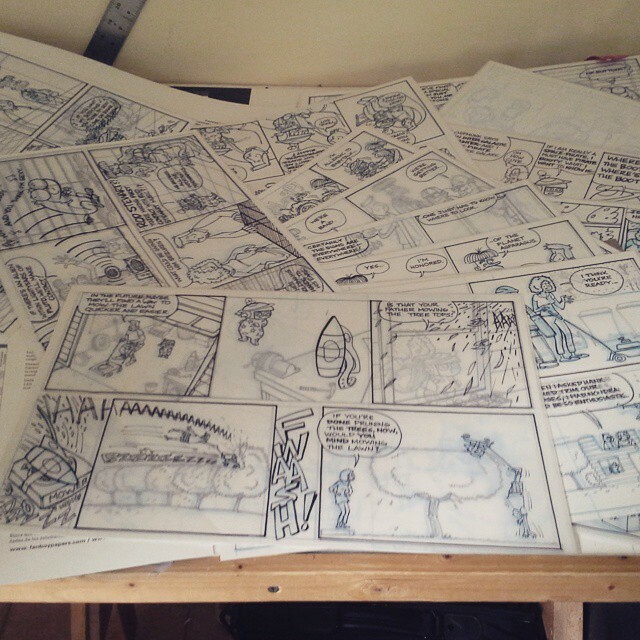 Those strips you see strewn across my drawing board in the photo above are the product of my “hiatus”, a brand new bunch of comics, which I’m in the process of coloring now. Time off was really no time off at all! For those of you introduced to the strip through the reruns that have been running on GoComics since August, or the material appearing at Tapastic.com, the transition should be seamless–picking up right where we left off. And for those of you who’ve been reading all along, I appreciate your patience! I promise–the new strips will be worth the wait!